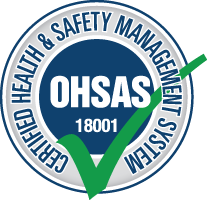 AMS-Power is an OHSAS 18001:2007 certified company that is committed to maintaining highest standards of HSE at all its facilities, projects, and works. ■ We are committed to keep our workplaces free from hazards; risks, injury and ill health at all times for our valu­able employees. ■ We constantly improve our health and safety management system through enhancements that comply with applicable Health, Safety and Environment Laws and Regulations of our country. ■ All of our employees are responsible for Occupational Health, Safety & Environmental matters under their control and are held accountable for any impact of their actions on Occupational Health, Safety & Environment. ■ Our senior management is responsible for ensuring aware­ness and the relevant training of company personnel in this regard, so that the employees can ensure all time compli­ance with the Occupational Health, Safety and Environmen­tal program. ■ We are committed to communicate this policy both inter­nally, externally in order to ensure that it is available to every concerned party.